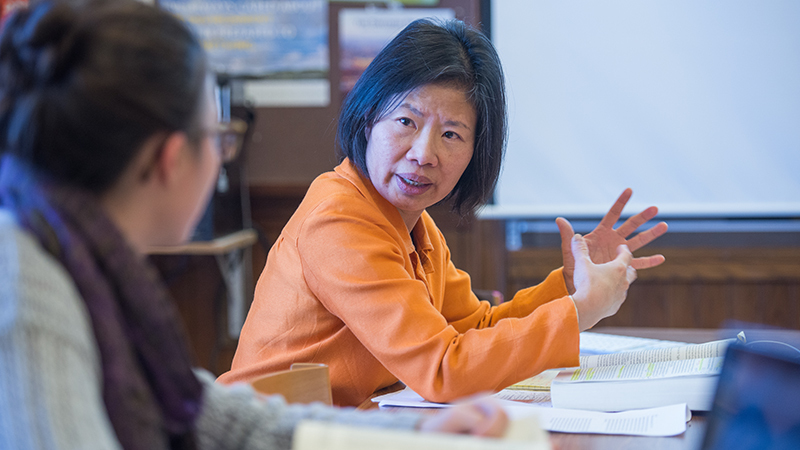 The Office of the Provost and Dean of the Faculty, in collaboration with committees of the faculty and other college offices, supports internal and external funding opportunities for faculty research and scholarship, teaching and curricular development, and professional development at Smith. Please see the following information on faculty compensation and development, internal starter or research funds, and the Lecture Committee; visit Sponsored Research for information on applying for external funding. According to its mandate in the Faculty Code (section 26), the Committee on Faculty Compensation and Development (CFCD) sets policy on and oversees the funding of internal grants for faculty development and scholarship. CFCD funding policy, including eligibility, access and application information for special fellowships, is laid out in the Moneybook. The Moneybook also includes brief listings of non-CFCD internal faculty research, teaching and professional development funding available around the college. CFCD funds are administered by Associate Provost Bill Peterson and Senior Academic Budget Manager Saari Greylock. Please contact Saari with any questions regarding CFCD policies or procedures (sgreylock@smith.edu, 413-585-3007). The provost's office oversees faculty starter grants and other internal research funds, which may be used broadly for expenses supporting faculty research, scholarship, teaching or professional development. Expenses and reimbursements must be submitted to the associate provost for approval; individual faculty or department chairs may not approve expenses against their own research funds or those of their colleagues. Expenses do not fall under the same restrictions as CFCD grants, but all expenses must adhere to applicable Smith College policies as specified by the controller's office. Please contact Saari Greylock, senior academic budget manager in the provost's office, with any questions on starter grants or other internal research funds. Due to the high volume applications received annually, the Lecture Committee strongly encourages applicants to submit all proposals for 2018-19 by the November 16 deadline. For several years, colleges and universities have developed policies that govern requirements and procedures related to ownership and commercialization of intellectual property. These policies have arisen because of the potential of new intellectual property to contribute to the social good and advance the state of knowledge, to absorb substantial institutional resources in its creation, to generate income, and to raise questions of actual or perceived conflict of interest for the inventor and the institution. This Provisional Smith College Intellectual Property and Technology Transfer Policy has been developed to reflect the unique culture of the college, a culture characterized by the college's interest in the advancement of knowledge, by its ongoing support for the professional development of its members and, reciprocally, ongoing contributions by individual members of the academic community to the health and well-being of the institution. In what follows, the term "intellectual property" refers to inventions, creations, new processes, innovations, tangible research materials, etc. - that is, all copyrightable or patentable works, and the patents and copyrights that reserve rights to them. The term "technology transfer" refers to the commercialization of such intellectual property. The term "creator" signifies the individual(s) who invents, creates, authors, innovates, etc., with respect to intellectual properties. In the past, at many institutions of higher education across the nation, intellectual properties that have been developed within the scope of the creator's employment and make extensive use of the institution's resources (e.g., funds, time, facilities, equipment) have been owned by the institution, whereas the ownership of literary, artistic and scholarly works has rested with the creator (unless they are generated within the scope of the creator's employment, commissioned by the institution, or subject to a sponsoring agency's agreement as approved by the institution). However, new technologies, including those involving computer software and hardware, and significant new investments in state-of-the-art equipment by many institutions of higher education, including Smith College, have necessitated a reexamination of intellectual property and technology transfer issues. This reexamination has led to a focus on the equitable determination of a property's ownership and the division of the rewards stemming from it, rather than simply on whether the property is patentable or copyrightable. This determination will now be based upon the level of contribution(s) of the parties, with the understanding that this policy is not meant to reverse the traditional ownership by the creator of, for example, a poem, a scholarly work or a painting. The governing principle is that the college has a claim to ownership of an intellectual property (which it might or might not choose to exercise) to the extent that the property is produced with substantial college resources beyond normal, or with substantial resources dedicated to the creator's use in the production of the property. "Normal" is taken to mean salary, office space, basic computer and clerical services. "Dedicated" resources are other facilities or support provided by the college and used by the individual. Therefore, the overall objective of this policy is to promote the creativity of the entire college community and to reflect the actual contributions of creator(s) and the institution in determining the rights of ownership and use, and the distribution of equity interests. This policy applies to all full- and part-time faculty members, administrative officers, staff members and students engaged in teaching, research, study or other forms of activity within the college or in connection with any college program. Individuals who are not employees or students of the college will be required to assign patent rights to the college, or execute an agreement covering patent rights, before being permitted to use facilities, equipment, employee or student time, or to process grants through the college. The development of a work of intellectual property, including computer software or hardware, of a seemingly patentable (or, if produced with substantial or dedicated resources, copyrightable) nature should be reported fully and in writing at the earliest time possible to the dean for academic development. The dean will consult promptly with the creator to determine issues of ownership, patent and copyright, technology transfer, and the distribution of potential proceeds, considering all aspects of the property, including but not limited to the extent to which college resources have been used. It is anticipated that in most cases a swift and amicable agreement will be reached. Should such agreement not be reached, an ad-hoc committee of college personnel—comprising one individual selected by the dean for academic development, one individual selected by the creator and one individual agreed to by both parties—will be appointed. Committee members will have knowledge about the particular field and/or intellectual property issues and will have no personal or compensable interest in the matter at hand. It will be the function of the committee to review the circumstances attending the property, including the prior investment of college resources, and to make a recommendation to the provost/dean of the faculty for a final decision. The committee will have access to legal counsel if the committee deems it necessary. To assist in determining whether substantial college resources have gone into the work, the creator(s) may wish to maintain a diary noting actual date, time and usage of personal and institutional resources. With regard to patentable (or, as qualified above, copyrightable) properties, the college and the creator may discuss whether either party, or both parties together, should patent or copyright, and market the property. In such cases the party assuming start-up costs for the prosecution and commercialization of the invention will have first claim on any income generated by the invention to recover such costs. After recovery of those initial costs, any income shall be divided between the creator and the college in accordance with the agreement described in Section B.
Alternatively, the college and the creator may, by mutual agreement, agree to assign jointly their rights to the property to a third party, in which case the income received from the third party shall be divided between the creator and the college in accordance with the agreement described above. At all of the decision-making points outlined above, decisions by both the creator and the college must be made in a prompt and timely manner and communicated completely, in writing, to the other party. If, at any point in the process, disagreements arise between the creator and the college, an ad hoc committee will be appointed as described in Section B to adjudicate the dispute. In the event that a grant or contract from a government agency or private sponsor contains provisions for the disposition of the rights to the property, those provisions must prevail and the college must carry out its commitments under the terms of such grants and contracts. Through its Provisional Intellectual Property and Technology Transfer Policy, Smith College has positioned itself to be a supportive partner to all those covered by the policy. As in similar matters, the college encourages individuals to err on the side of disclosure for the protection of both the college and the individual.